on saturday, the hughes drove their new motor home over from pensacola and we hung out w/ them for the day. 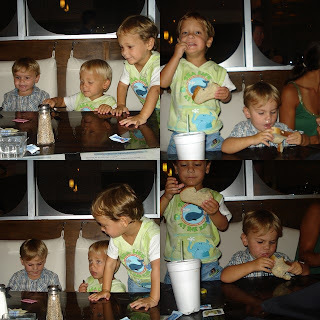 i didn't take many pictures, but that night i got a few pictures of the 3 stinkers while we were having dinner at live bait. after dinner, we hung out at the wharf for a little and as you can see the kid's entertainment was playing in the sprinklers. brady cole was soaking wet. 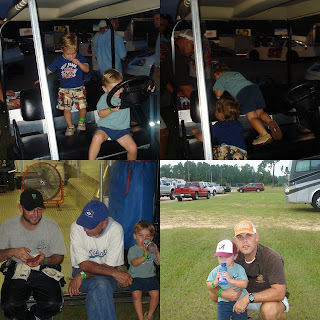 this past friday we met rj, jenn, aiden and austin at the races in pensacola to watch mr augie race. brady cole enjoyed the races for the most part. up until the end when it was waaayyyy past his bed time, he started getting pretty cranky. i was a little nervous b/c i thought maybe it would be too loud for him, but he did good w/ that part. he loves race cars. when he sees one on tv he says "look dada, races." this little boy loves to play baseball lately. aunt shelly, uncle brad and letson bought him this espn baseball thing for his birthday that he absolutely loves. for a 2 yr old, i think he's got quite the stance and the swing. he'll hit the ball and then take off after it. i recently taught him how to run bases while at buger's softball games. you can imagine what we're doing while buger's playing softball now. the first thing he says when we pull up to the park is "mama, i want wun bases." 2 wks ago my friend jessica, who i haven't seen in quite some time paid us a visit. we had a great time while she was visiting and it was great seeing her considering it had been a while. 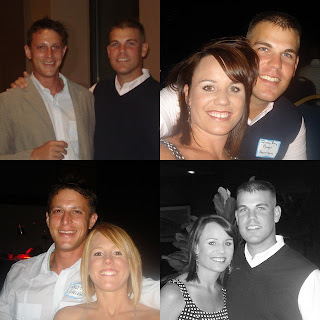 brady cole loved her so much and woke up last week still asking where "jessa" was? i know he's ready for her to visit again! 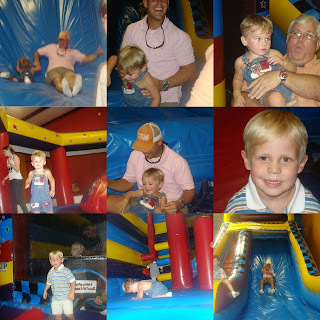 on our way back home on sunday afternoon, we stopped at pump it up in pelham for camden's 4th b'day party. 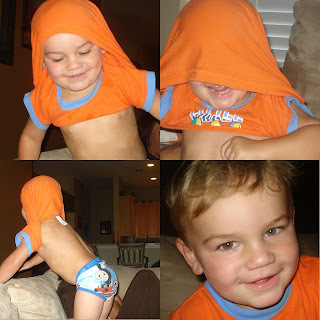 that was brady cole's first time there, and boy did he have some fun. he thought he was so big jumping and sliding w/ all the big kids (some of taylon's buddies). it made me just a little nervous, b/c i could just see us making a trip to the ER w/ a broken arm. as you can see, buger had just as much fun! i've noticed, i'll have to fix my pictures later. picasa was acting up last night. we enjoyed spending time w/ baby ryleigh and her mama on friday. brady cole liked that "babeeeeee" too. that's what he says when he sees babies. he's kinda obsessed w/ them right now. he even wanted a baby doll in target last week, but i quickly decided against that b/c i knew buger would kill me. while in birmingham this past friday-sunday we met up w/ jessica and baby ryleigh and did a little shopping. 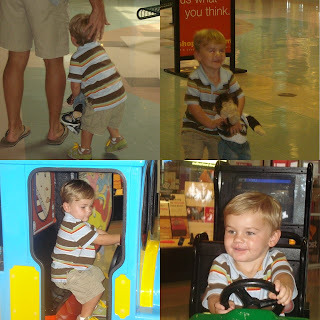 during the shopping trip brady cole got to build his first build a bear. i wish i had pictures because he did so good. 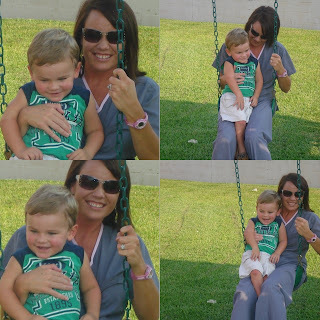 he did everything the lady told him to do w/ his heart for his new monkey named "chipee." he loves chipee so much and chipee is now going everywhere w/ us. he even tells chipee what to do, feeds him mac n cheese crackers and loves sleeping w/ him. i'm sure we'll be making trips back to build a bear in the future. that doesn't want to let go of his his balloon that he got from cousin camden's birthday party!